Aloe Ridge Self-Catering - Hartenbos Accommodation. 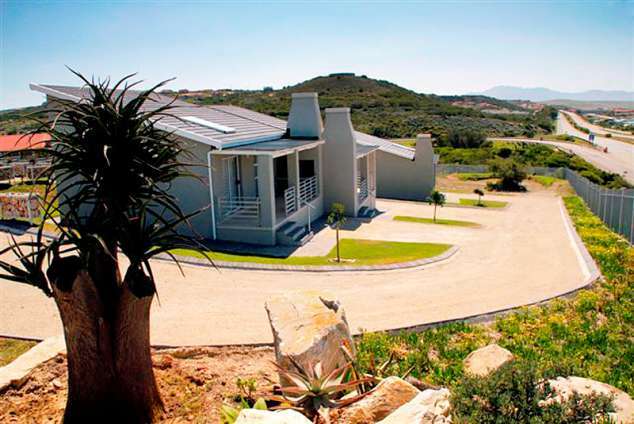 Aloe Ridge is situated halfway between Dias Beach and Hartenbos. It is the closest accommodation to the Langeberg Mall and also the nearest to the Mossel Bay off-ramp. We are centrally located with many activities close by. The George airport is approx. 30km away where various car rental options are available. With activities such as golf courses, sandy beaches, indoor swimming pools and an entertainment centre (Blasters) close by, young and old will be entertained throughout the holiday. The units can accommodate 4 people and are very neat and comfortably furnished to ensure that you will enjoy a relaxed holiday. There are two bedrooms, one with a double bed, and one with two single beds, as well as a sleeper couch in the lounge. Linen is provided. The kitchen is equipped with crockery and cutlery for 4 people, a built in oven, microwave, fridge/freezer combination, kettle and toaster. The lounge has a television with DSTV. Undercover braai on stoep. Safe parking in complex. 47797 page views since 17 Nov, 2010. Last updated on 21 Feb, 2019.